If you’re here it means you’re looking for the best depository safe reviews, and that’s what I provide. Not all safes are made equal, even though they have the same purpose, protect your valuables. In the following review guide, I’ll go over the top products available and offer buyers’ tips to help you get started right away. If you have been reading drop safe reviews, you’ll notice that they’re among the most varied in terms of features and specs. Yes, they are all for safeguarding valuables, but some are safer than others. There used to be a time when depository boxes were just for large commercial enterprises, but now there are units for office and small business use. They’re solidly built, offer adjustable storage options and extra security features. Don’t confuse a depository safe with ordinary gun safes as these are more secure. Let’s take a look at your options right now. Brands all claim to offer the best drop gun safe, but it really depends on your needs and what you want with it. What are you going to put in the safe? The kind of items you’ll put in the box determines what type of depository safe you should buy. Prices range from less than a hundred bucks to more than a thousand, and that should tell you how varied its features are. The larger the size, the harder it will be for burglars to steal, but it’s also less portable. What type of security features does the safe offer? Look into these as well and make sure it’s appropriate for what you’ll be putting there. At the very least get a safe with heavy duty locks, and if there is a biometric feature, that’s a good option to have. Make sure there is a backup key included just in case you forget the code. A well-made safe is made from solid steel and heavy. But there are other features you need to look for such as the following. Look for depository safes with concealed hinges, a thick metal door, and heavy duty bolts. These are standard features in quality safes and should be present in the one you buy. A fire rated depository safe is going to provide additional protection for the items you have in the safe. The most common types are dial and electronic keypad. Some safes use or the other while others offer a combination of both. Dial combinations are cost efficient and found in all depository safes. Electronic keypads are easy to use and allow you to modify the code whenever you like. Biometric systems allow you to use your fingerprints for quick access to the safe. After doing a lot of research, I’ve come up with the top 5 drop and bank depository safes. This is one of the best drop gun safe available, a nice compromise between the pricey models and those which are too cheap. Made with business establishments in mind, you can use this to safeguard cash, deposit slips, receipts and other items. The safe measures 15.33 inches x 13.5 inches x 19 inches, so there is enough space here for cash, receipts, and other items you’ll need to deposit daily. Because of the jagged teeth in the drop slot, you don’t have to worry about losing the items inside. It’s easy to set the password, and its versatility means you can use it for almost any enterprise. Another nice feature is the lockout after 3 failed attempts so anyone who tries to guess the code will be deterred. You can adjust the password for extra security, and there are emergency keys and 2 digit pin codes included. The safe uses batteries efficiently, but just in case you can use either method to retrieve the contents. The safe has a set of jagged teeth at the top to deter theft, and you can fasten the box safe so no one can carry it off. At 71 lbs. the safe is also quite heavy. The Barska is built out of thick, heavy steel, ensuring the door and walls cannot be easily penetrated or drilled. Other protective features are its deadbolt locks, protective floor mat and 2 mm thick door. 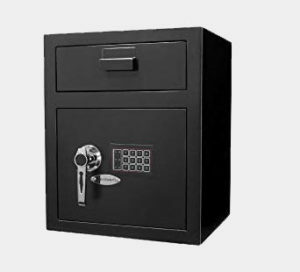 The Barska depository safe is ideal for businesses that have varying depositing requirements. SentrySafe manufactures a lot of security solutions, and their depository drop gun safe is one of their best yet. It is made of solid steel and has the features that make it suitable for companies and individuals. The SentrySafe has a 3 mm body and a 12 mm steel door, so when you or your employees put something inside the safe it stays there. 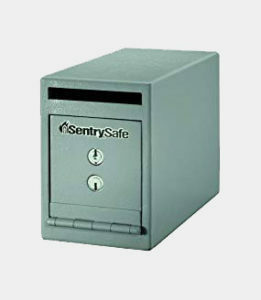 Compared to other safes the Sentry Safe is more durable. The dual key lock may seem like an inconvenience, but it’s actually one of the strongest security measures in the safe. Even if a burglar hacks into one keyhole, there’s still another one to get through. It has an anti-pry door, and you’ll need to use both keys to open. With the dual key lock feature and heavy steel built, it’s going to take a lot of effort to get into the contents. There are pre-drilled anchor holes at the bottom so you can anchor this on the floor. A complete kit is included so you’ll be able to set it up quickly, and I also want to add that the piano hinge for the bottom side is an added safety boost. The steel used for the safe is of the highest quality, and its powder coated finish keeps the safe from deteriorating even with constant use. The interior dimensions are 6.5 x 5.8 x 10.5 inches so there is ample room for cash, receipts and other papers you use for financial transactions. 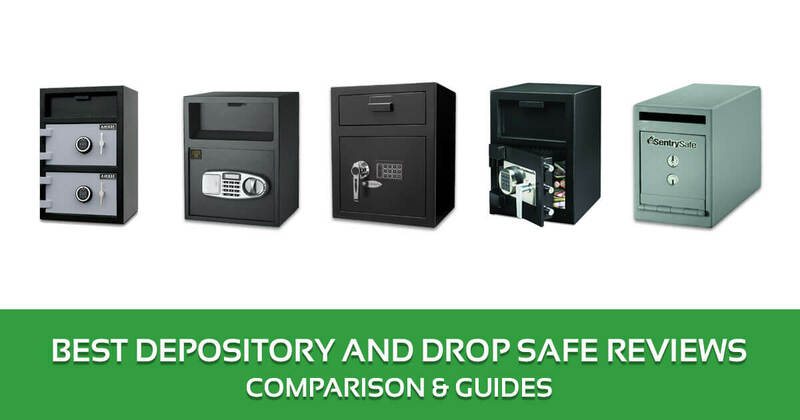 The Sentry Safe Drop Safe is an excellent choice for businesses that need a small but reliable depository solution. 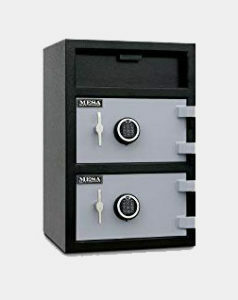 The Mesa Depository Safe is ideal for any company that handles a large amount of money. As you would expect from a high quality safe, the safe is made from heavy duty steel and has features to deter attempts at robbery. The safe is 20 x 20 x 30 inches, meaning there’s space here for plenty of documents, cash bags and other items. Because of its simplified design you can modify the settings without the need for a locksmith. If you’re looking for a system that allows quick deposits without granting physical access to the content, the Mesa will do. Unlike other safes the Mesa is easier to use and at 176 lbs. is the heaviest in this list. The Mesa has a specially designed electronic keypad which accepts up to 5 different user codes. You can also program the safe to accept entry with either one or two codes. The front loading hopper design makes it convenient to use, and the internal spring reclocking mechanism keeps the safe secure. While the Mesa offers tight security, it’s easy to retrieve items in your safe. The user guide makes it clear how to program and give authorized people access. The Mesa design gives you greater flexibility for using the safe. You can use this in the office and configure it so only certain people have access, but everyone can put money in the drop slot. If you don’t want to compromise when it comes to security features and won’t settle for cheap brands, then the Mesa Safe is your best option. 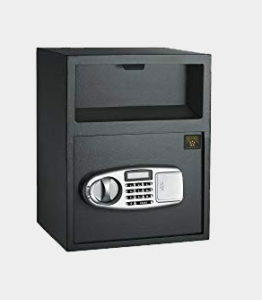 The Paragon digital depository safe is meant for use in hotels, restaurants, and even your home. It works like a typical post office box but offers more security so the coin bags and valuables you put in remain safe. The electronic keypad is intuitive and allows for infinite changes. Apart from the lock, you also benefit from the heavy-duty steel body. The safe has holes pre-drilled so you can anchor it, and the thick steel will discourage any attempt at prying the door off. Apart from the 11 gauge steel, the hinges are concealed so no one will be able to tamper with it. Like other high-quality safes, the Paragon has a carpet mat to protect the items inside and keep the surface from getting scratched. The Paragon has a spacious interior so you can put log books, documents, stacks of receipts, checks, and other items here. The 2 in 1 design is really a space saver and helps you keep things organized. The electronic lock can be programmed easily up to 8 digits. The instructions make it easy to set the passcode just as you want it. At the top of the safe is a slot, and the design simplifies deposits of your daily transactions and records. The front load drop style is accompanied by a Sawtooth edge tilting baffle plate, ensuring the content cannot be pulled out. The Paragon is the ideal choice if you’re after a high quality, cost effective safe for home or business use. 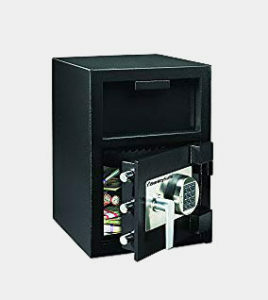 The Sentry Safe is an all-purpose safe that you can use to collect deposit slips, cash and other business papers. Typical of other depository safes, the Sentry Safe has anti-theft protection built in. The safe sports a black finish and powder coated to ensure its longevity. It’s packed with a lot of features but easy to use provided you follow the instructions. When you unpack the safe you’ll need to program it to suit your needs, but the process is straightforward. Thanks to the drop feature even employees without knowledge of the code can use the drop slot. The Sentry Safe designed this for use in business establishments, and it shows in the quality. Apart from heavy steel, the safe has a reinforced anti-drill lock plate, vault ball bearing hinge, and pry-resistant 12 mm thick door. The electronic keypad is programmable and comes with a relocking feature. A time delay is built in as well. The safe’s anti-fishing mechanism keeps the content safe, and once you anchor it to the floor becomes even harder to burglarize. The safe also weighs 100 pounds empty which adds to the difficulty of moving it. The Sentry Safe Depository Safe is one of the better models that Sentry Safe has released, and it’s got the features that should suit most businesses. A wall depository safe offers several benefits that regular safes cannot provide. Here are few examples. Protection from Thieves: small safes can be opened with a pry bar or a drilling tool, but drop safes are built to withstand those kinds of attempts. Protection from Natural Disasters: fire and flood can strike anytime and take away your most cherished possessions. With a drop safe you’ll be able to safeguard bank documents, receipts, cash, documents, office papers, credit cards and other important items. Cost Effective: drop safes and bank depository safes are no longer as expensive as they used to be. Their security features have improved as well so it’s a good investment. Available in Different Sizes: sizes range from 4 x 10 inches to those two feet or higher. This allows you to pick the right size and go with what suits your needs. Easy and Quick Access: with all your documents in one place, you don’t have to worry about misplacing them. Just return the item to the safe and it’ll still be there when you open it. Multi-purpose: you can use your drop safe at home, the office, your shop, etc. Among the trademarks of a high-quality drop safe is the need for little maintenance and ease of use. Even so, there are instances where problems arise from their use, so keep the following in mind. Keep the emergency pin codes or backup keys with you. If you lose them you’ll have to contact the manufacturer to retrieve the contents. Drop safes have different levels of security, and you should be aware of what it’s capable of before buying. The more valuable the item you’ll put in, the greater the security features must be. Even if you’ve got a heavy drop safe, anchor it anyway. If you’re using the drop safe to store electronic devices, don’t forget to clean the item regularly. Is the safe moisture proof? Make sure that it is before putting any moisture sensitive items inside. Trusted partners and individuals should know how to operate the safe. In case you’re not at the establishment and an emergency occurs, they’ll know what to do. Take care of the safe: even if it is fire rated, waterproof or made to withstand a two-story fall, that’s no excuse to get careless and not handle the safe properly. Are these depository safes like those used in banks? The best safes provide high level of security, but for business use, they are adequate. They are also made of solid steel and offer enhanced security measures. How many types of drop depository safes are there? Drop safes are categorized by the door design, i.e. top door, front door, rear loading door, etc. Some drop safes are also classified by the security system used, i.e. dial, keypad or biometrics. Which locking mechanism is best for drop safes? The best are those that offer a combination of dial, electronic keypad, and biometrics. A dual access has greater security and offers more entry options, essential if you do a lot of transactions daily. Is it necessary to anchor a drop safe? No, but securing the safe on the wall or floor will prevent burglars from just taking the safe. Even if you lock up after you leave the building, it is belter to anchor the safe to the floor. How thick should the door be? The thicker the door and walls the better. 7 or gauge steel is the ideal choice, but thinner steel is acceptable if the hinges and bolts are heavy duty. All the five drop safes are high quality, but if I have to pick a winner it’s the Mesa Safe MFL3020EE. It’s solid steel, durable and was built expressly for theft protection. The MFL3020EE is the safe to use for your business whatever it may be. Even if you’ve got a CCTV and a security alarm, it’s still necessary to have a safe to safeguard your profits. I hope the best depository safe reviews here has given you insights. With the right safe, you can go home knowing your earnings and valuables are safely kept. Having been a gun owner for over 10 years, my arsenal has been growing significantly. I used to stack my guns in the store but I thought checking online for a big electronic controlled gun safe to help out. Courtesy of the review, I bought the Barska Large Keypad Depository Safe and it seems to serve me well.